This issue, we interview Scott Mohnkern, a Free Spirit Gathering regular and author of A Year of Viking Rituals and Hanging From the Tree: Living With the Runes. Mohnkern has some advice on the ins and outs of self-publishing, and explains that there is more to a blot than drinking mead …. Eternal Haunted Summer: If you could correct one common misconception about modern Heathenism, what would it be? Scott Mohnkern: Most people who encounter Heathens see it as “pagan lite.” The rituals typically are short, and most involve the use of alcohol for purposes of toasting. Heathenism is a religion that is far more about what happens outside of “ritual” than inside. It’s a religion that’s about building community, and not just about developing a relationship with our gods during ritual, but on an on-going basis. A close second to this is that Heathenism is a path that tends to have a very “sexist” view. Many non-practitioners see it as a male-dominated philosophy in which women are not given equal status. In fact, if one looks at how Heathenism functions, women have greater roles of leadership than men in many areas. Women serve as primary leaders within the household, and within the family, which is where Heathenism’s core is at. EHS: What drew you to Heathenry? And was your path to Heathenry pretty straight-forward, or rather round about? SM: I was raised Methodist, and separated from the Methodist church in my early teens over gay rights. (At the time, the church would not allow gay ministers). I’d been largely agnostic into my early 20’s, and began exploring Paganism in general when my wife joined a formal Wiccan coven. It was very clear from the beginning that there were two paths I was drawn towards: the Native American practices of the Southwest, and the Northern European Gods. Unfortunately my early introduction into Northern European practice started with resources that, in retrospect, were terribly documented. I moved from Colorado to the East Coast in 1994. I encountered a local Pagan Gathering where I met the members of Raven Kindred South. I went to all the classes their members were teaching, and it truly sounded with me. I ended up not getting involved with that kindred, as at the time I was running my own business, and was extremely busy. I started as a solitary, and studied on my own until around 2000. I had gone to Free Spirit Gathering every year, and developed a reputation as having strong Northern European knowledge. It was suggested by the individuals who ran that event that, since Raven Kindred had stopped attending the festival, I offer a few classes. It started with one class and within two years expanded to five classes, daily public blots, and two sumbels at the festival. I drew enough interest that I formed a Heathen working group in Maryland, which continues to operate today. Its purpose is a combination of monthly rituals, and also organization of what courses each person is teaching, and where. It lightened much of the load on me, and allowed me to begin to teach more advanced topics. I had been pushed by several individuals during this time to write a book. Classes I taught had huge handouts (sometimes twenty pages or more), and people kept saying “I wanted to go to your class, but I couldn’t because of another class, a ritual, etc.” So, starting in 2008, I began the creation of A Year of Viking Rituals and released it in 2009. EHS: What kind of research went into A Year of Viking Rituals? Lots of books? Personal experience? Discussion with other Heathens? SM: I’d studied blot structure for over a decade, to the point where it was well ingrained in my practice. By the time I started the book I’d done easily over fifty blots for groups, and began to have a deeper understanding of the blot, the sumbel, and the purposes they served. I also realized that Heathens aren’t just about the blots and sumbels. They are about feasting, and talking about important topics. Each month I’d sit down with the blot I’d written that month for my group, and then add feast ideas (some of which I’d served at the event, sometimes not), and discussion topics I’d encountered over the years. I had read Diana Paxson’s Taking Up the Runes, and thought it would be interesting to take a pair of runes, and add them to a discussion of a given deity. Clearly there wasn’t any historical basis for this, other than the meaning of the rune itself and the rune poems. However, we could take aspects we did know about the deity from the Lore, and pick a rune that had meaning with respect to that deity. And finally, I decided to add meditations. Meditations clearly do not have a place historically within Northern European tradition, with perhaps the exception of the concept of the bezerk. However, I have found that meditations provide an alternative approach to understanding and thinking about our Gods that we don’t have in other approaches. In particular, it is important to remember that Heathens see the Gods and Goddesses as family, such as a great uncle or aunt. By doing a meditation where we encounter and speak with this God or Goddess, we can gain a better understanding of what that God’s or Goddess’ intentions are. 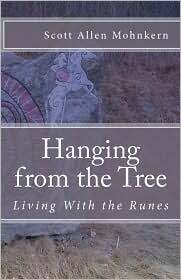 EHS: And what about Hanging From the Tree: Living With the Runes? How long have you been working with the runes yourself, and what compelled you to write a book about them? SM: I’ve been drawn to the runes since as early as 1991. I started devoting serious study with them in 1999, and have continued ever since. Writing this book was a tough decision. There are many many good books out there, whether you are a strict reconstructionist (where Plowright’s book, The Rune Primer, is an excellent source), or if you accept Unverified Personal Gnosis (UPG) as a method of using the runes. I asked myself whether I truly had anything to contribute to the literature. I’d been teaching, and clearly there were people that found my teaching valuable. However, to release a book is an indication that you have something of substance to say that had not been said before. I came to the conclusion that I was in the somewhat unique position to make a solid statement that UPG can be a part of our practice, provided that it is grounded in the lore, and that we are up front about this. In addition, I could take my process of “teaching the runes” and put it into a “self study” class that would be helpful to solitary practitioners, or groups that wanted to start a rune study program within their group. It also served as a text for non-Heathens that wanted a good understanding of the runes. EHS: A Year of Viking Rituals includes blots for a number of different Deities, including Thor, Freyja, Sunna and Baldur, to name a few. How did you go about designing these blots? SM: The rituals from this book started with my group. Each month we do a blot to a deity. How that is chosen is largely based upon my personal mood, the season, and the needs of my group. For example, at one point a member of my group had a spouse who was having significant health issues. He asked we do an Eir blot, so he could offer a sacrifice to that Goddess. I learned that other members of my group were feeling the need for this type of healing, as well. After the Deity was chosen, I’d study on Him/Her for some time, reading the lore, engaging in discussion, and doing some personal contemplation on the Deity. I’d then sit down and write the blot. I would keep the “core structure” the same, but try to add something different in each one, so that it didn’t feel like we were doing the same thing each month, and were only changing the name of the Deity. I also through time tried to be more inclusive about items such as readings, meditations, etc, to allow people other than the Gothi and Gythija (Priest and Priestess) to lead. EHS: Blots are considered to be one of the central rites of Heathenism. How would you describe the blot, and why it is so important, to someone from outside the tradition? SM: The basic function of a blot is that it is a sacrifice to the Gods. It is an opportunity for us to both express appreciation for the gods and their roles in our lives, and also discuss challenges that may exist in the future that the God can assist with. It’s critical to realize our Gods don’t solve our problems for us, but they can help us along the way. As I’ve thought about the blot (and many Heathens agree) it is a ritual that is about strengthening and affirming our relationship with our Deities. It allows us to tell the Deity our current thoughts and feelings. The basic structure varies depending upon your group, but the core of it is 1) opening ritual space, 2) making a statement of intent, 3) doing a round of toasts, 4) offering a sacrifice to the deity, and then 5) closing the ritual space. In ancient times this sacrifice was done with horse blood. However, through time, that has changed to mead (the drink of the Norse Deities) or ale. EHS: You published A Year of Viking Rituals and Hanging From the Tree yourself. Why did you go the self-publishing route? SM: I had a friend who had written a work of fiction which was quite good, and had tried to find a publisher with no success. He even had difficulty finding an agent. He ultimately went down a self publishing route, and had some success in this process. I looked at the major Pagan publishers and there were two issues that I found. The first was that the publishing schedules were lengthy, most times eighteen months or longer, from submission to publication. The second was that I was part of a tradition that was sufficiently small that there wasn’t a large market. I explored my self-publishing options, making sure that there were no up front costs and found two excellent options: Lulu.com and CreateSpace. Two of my books are with CreateSpace, and one is with Lulu.com. I’ve subsequently gone back to one of the major Pagan publishers. Now that I’ve established there is a market for the book (I’ve sold several hundred copies, which in the Pagan industry is outstanding), they have indicated some interest. I expect that in the fall I’ll enter into discussions with them. It will give me a wider distribution, at the cost of some profit. EHS: What advice can you offer other Heathens and Pagans who are considering self-publishing? Things they absolutely must do and mistakes to avoid? SM: First, if you are self publishing, there should be no mandatory up front costs. There are a lot of scam artists out there. Make sure who you are going with doesn’t make a lot of promises about marketing and then says you have to put up a lot of money. For A Year of Viking Rituals my up front costs were $39. This cost was entirely optional, but gave me more profit per book.Hanging From the Tree had no up front costs, but I make less money per book. Second, find an editor. After A Year of Viking Rituals came out, I was mortified to find that there is one mistake on the very first page and there is a misspelling of one word, and even worse, it is underlined. I’m sure there are lots of others. That was after I’d done six rounds of edits. This year I found a friend who had expertise in editing, and offered a piece of every book and credit in the book information in exchange for editing. This has turned out to be a huge benefit. I did find one typo in Hanging from the Tree. However, it was a font issue, and the editor didn’t have the same font I did. Third, despite the cost, order “page proofs” of your book (hard copies before publishing) and edit on the printed page. It slows down the publishing process, but you find a lot more mistakes that way than you do when reading from a screen. EHS: Where can curious readers find your books? 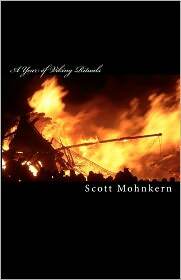 SM: Amazon has all my books, and you can do a search on “Scott Mohnkern” to find all my titles. You can also go to Modern Heathen and find links to my books. EHS: Which resources (books, websites, email lists, journals, et cetera) would you recommend to someone interested in Heathenism? SM: There are many. I would obviously start with my own web site, The Modern Heathen. Also, purchase copies of Idunna (a Heathen journal) on Lulu.com. The Raven Kindred South site has not been updated in years, but continues to have excellent information. For primary sources on a budget, I recommend Sacred Texts. SM: I’ll be teaching at Free Spirit Gathering this June. I am finishing up More Viking Rituals, which has twelve more rituals, feasts, meditations, and discussions related to twelve new deities. It should be out by June. After that book is out I intend to release a hard bound edition containing both ritual books, for anyone that wants a “tabletop worthy” edition of the book, or for a group library. After that I will be working on a book of Heathen meditations. There will be twenty-four rune meditations and twenty-four God/Goddess meditations. Subsequent to that, I’ll be working on a book about Heathen ethics. The current working title is Ancient Values for a Modern Age. EHS: Which fairs, conventions, or other events will you be attending this coming year? SM: I just returned from Beltaine in Darlington, Maryland, and will be at Free Spirit Gathering in June. I’ll be at Fires of Venus in September. I’m currently in negotiations with the Owl’s Nest of Frederick, Maryland to do a book signing. I am always open to teaching and attending other festivals. If you’re a member of a festival staff, and are interested in having me attend to teach, please contact me through the editors of this magazine.